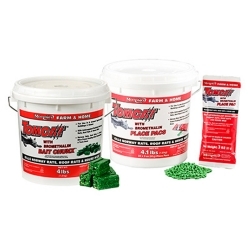 Motomco Tomcat with Bromethalin single-feeding bait for control of Norway rats, roof rats and mice, including anticoagulant-resistant rodents. For use in and around homes, commercial and agricultural buildings. 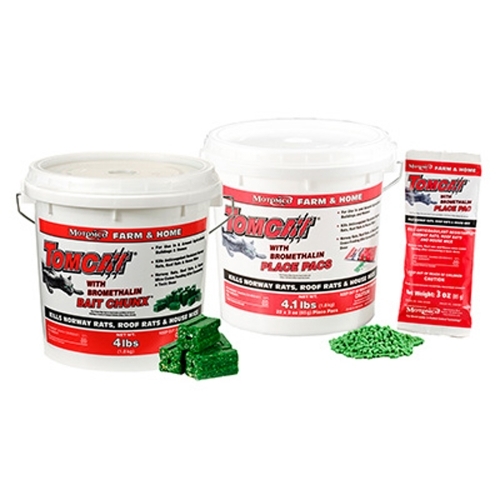 Tom Cat bait kills rodents in just 1-2 days. Ready-to-use. Multi-edge shape satisfies rodents' desire to gnaw. Mold and moisture resistant. Fit easily into small openings, burrows or bait stations. Use indoors and outdoors. Each 1 oz block can kill up to 12 mice. For Rats – 1-6 blocks per placement, spaced 15-30 ft apart; For Mice – 1-2 blocks per placement, 8-12 ft apart. Keep bait fresh, while still releasing aroma. Pre-measured, ready-to-use pacs protect pellets from natural elements. Can be used for burrow baiting. 3 oz. For Rats – 1-2 pacs per placement, spaced 15-30 ft apart; For Mice – open pac and apply 1/4 to 1/2 oz per placement, 8-12 ft apart.